We are currently in the programming period 2007-2013, which provides funds to approximately one third of the EU budget, and establishes a new framework of EU regional policy in order to contribute to the agenda for growth, competitiveness, employment and sustainable development objectives set in Lisbon and Gothenburg respectively. The FEDER aims to strengthen economic and social cohesion in the European Union by correcting imbalances between its regions, and to that end is involved in the three new regional policy objectives "Convergence", "Regional competitiveness and employment" and "Cooperation European territorial. " The FSE aims to improve employment and job opportunities in the European Union. Involved in the framework of the objectives "Convergence" and "Regional competitiveness and employment". 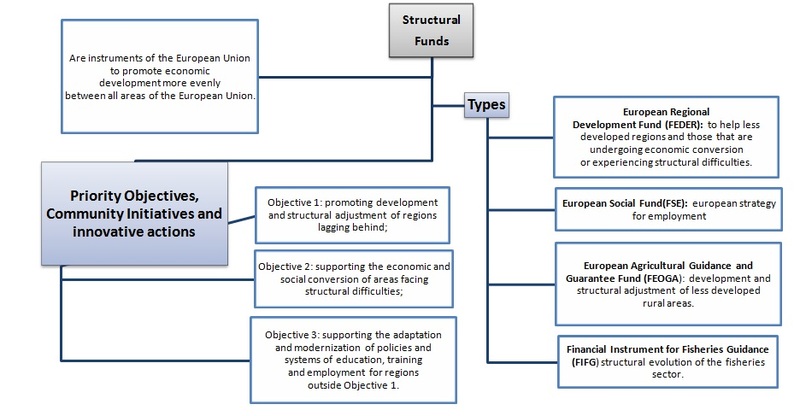 Finally with the Structural Funds, Cohesion Fund finances the cohesion policy of the European Union, and specifically promotes economic growth and real convergence of Member States of the Union with a lower level of development whose gross national income (GNI) per capita is less than 90% of EU average. This is the case of Bulgaria, Czech Republic, Estonia, Greece, Cyprus, Latvia, Lithuania, Hungary, Malta, Poland, Portugal, Romania, Slovenia and Slovakia. Support actions under the "Convergence" objective, specifically in the areas of environment and trans-European transport networks.